 What is Romanesque Architecture?  What are the Main Characteristics of Early Romanesque Architecture?  What are the Main Design Features of the Mature Romanesque? In Medieval art, the term "Romanesque architecture" describes the European style of building design which flourished during the late Medieval era (c.800-1200). It is traditionally divided into three periods: (1) Pre-Romanesque: Carolingian & Ottonian architecture (c.800-1000). (2) Early Romanesque (11th century). (3) Mature Romanesque (c.1070-1170). The most important type of religious art produced during the Middle Ages, Romanesque design was influenced mainly by classical Roman architecture, as well as elements of Byzantine art, and Islamic art. It was characterized by a new massiveness of scale, expressing the increasing stability of the age and the re-emergence of European culture after four centuries of the Dark Ages. Despite a reduction in tension, however, a certain amount of uncertainty remained during the period 800-950, which was why Romanesque designs often doubled up as defensive structures. 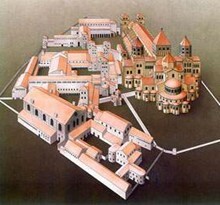 The final defeat of the Barbarian marauders by Emperor Otto I in 955, gave further confidence to the Roman church and its monastic orders, whose expansive building program led to the creation of three distinct structures of Romanesque architecture: the cathedral, the monastery and the castle. Cathedrals, which evolved from the early Christian basilica building, were constantly being renovated and enlarged throughout the Romanesque and flourished in an urban setting. Monasteries first arrived in Europe from Byzantium in the 5th century, and flourished as centres of rural adminstration in the age of Charlemagne. (See also: Carolingian Art: 750-900.) From humble beginnings, a number of monasteries grew into elaborate abbey complexes. The castle developed later, in response to the political instability of the 10th and 11th centuries, and became a major feature of the mature Romanesque, notably in Britain. A survey across the fine arts. Architectural reliefs and column statues. Review of gospel illuminations of the Middle Ages. Part of our Medieval Book Painting Series. Characteristics and History of French Murals. Characteristics of Murals and Altarpieces. History of Religious Murals in Spain. What are the Main Characteristics of Early Romanesque Architecture? The fundamental emblematic structure of the Romanesque was the church. Since churches were built to serve the specific requirements of the liturgy, their construction changed as those needs changed. The relationship between an architectural form and its meaning was reflected in the arrangement of the internal areas of churches, which was based on the complementary relationship between the plastic mass of the building and its atmospheric mass. Romanesque architects re-used the rounded arches, wall masses and barrel-vaults of the Romans, but they also introduced changes. Indeed, while marked by a cruciform floor plan, the early Romanesque saw the overcoming of Byzantine models and the abandonment of the formal language of classical antiquity. The column was replaced by the pillar; spaces previously left empty were filled with thick walls, forming compact masses (compare Gothic style designs); and the elevation of walls was divided into three or even four levels (arcade, gallery, triforium, and clerestory). The major structural change, a result of advances in construction techniques, was the progressive ability to cover churches with vaulted ceilings. The need to enlarge the choir and to alter the arrangement of the presbytery - to allow pilgrims to file past relics and other precious ecclesistical treasures - led to revolutionary changes in the eastern ends of churches. The adoption of the choir with ambulatory, in combination with the transept and the crossing tower, led to a variety of spatial articulations. The achievement of visual, perspective, and chiaroscuro effects in the interior resulted in the creation of an articulated structure on the exterior, with varying combinations of volumes decorated with stylistic elements from antiquity, such as pilaster strips, hanging arches, and blind arcades. The abbey of Cluny (begun 10th century), thanks to the compositional innovation of a second transept to increase the church's capacity, is the most grandiose layout of all the Middle Ages. With a nave and doubled aisles and an ambulatory choir with radiating chapels, a large narthex, and seven towers, it is such a monumental structure that the involvement of the great abbots, notably Peter the Venerable, was probably decisive in both its planning and execution. Note: Founded in 909 by William Duke of Aquitaine, the Cluniac order became well known for its artistic expression and kept up to date on technical innovations in architectural design. The order saw the liturgy as the focal point of monastic life and celebrated it with an astonishing magnificence, making use of enlarged spaces for choral singing and numerous altars for private masses. What are the Main Design Features of the Mature Romanesque? The Romanesque had reached maturity by the late 1060s. There was the more or less total adoption of the vault covering, symbolic of the progress made in construction techniques but also a deliberate stylistic choice, and experiments were being made in certain constructive and formal aspects of churches, such as systems for articulating the walls, which were still divided in bays with an elevation on several levels. This articulation was no longer applied exclusively to the nave but was being extended to all of the church, to the walls of the transepts, the presbytery, the apses, even the exterior. The changes in church architecture were related to precise figural purposes: to welcome, shelter, and embrace the faithful in a setting both stately and dignified, designed along perspective lines to give a sense of depth, all culminating in the ambulatory apse. Church interiors were a complex and densely moulded material characterized by strong chiaroscuro contrasts that reinforced the plastic outlines of the columns and increased the sense of layered atmospheric density and spatial depth. From the structural point of view, this was made possible through the adoption of the system of bays taken as spatial units; they were no longer divisions, marked off by transverse arches, of a unitary space, but were rather spatial bodies that were added one to the next, an addition of cells in a rigidly symmetrical order. The isolated crossing had become a normal element that constituted the fulcrum of the building, conferring order and measure. The wall itself went through a transformation. It was now structured as a plastic mass that could be disassembled and into which space could enter by way of openings in its surface, sometimes creating internal galleries along which people could move. By then, the pier had taken the place of the column almost everywhere; in Italy, ornamentation and wall sculptures became more common, but without suffocating the architectural function of the wall. Some expressions of Romanesque architecture seem inseparable from their natural setting. Outstanding examples are the abbey of Mont-St-Michel in Normandy, (the regional home of the Romanesque Bayeux Tapestry) suspended between earth and water, the basilica of Sainte Foy at Conques, set atop a steep cliff in the Auvergne, or the cathedral of Trani, Italy, overlooking the Adriatic, its bell tower serving as a welcome beacon to sailors. The Cathedral of Santiago de Compostela, the final goal of the pilgrimage routes to the tomb of the apostle saint (St James), despite its monumental size, repeats in large part the building models of the period: a basilica with a nave and two aisles with galleries, transept, and choir with ambulatory. Because of the absence of direct illumination of the nave, the enormous space is immersed in a half-light that brings out the severe articulation of the architecture. The choir alone is crowned by windows, which cast an almost mystical illumination on the tomb of St James. Most arches were semi-circular although a few buildings (Autun Cathedral, France; Monreale Cathedral, Sicily) have pointed arches. Narrow windows/doors might be topped by a stone lintel. Larger openings were nearly always arched. These massive supporting walls had few and comparatively small openings and almost eliminated the need for buttresses. These were a particularly popular feature. Note: an arcade consists of a row of arches, supported on either columns or piers. Columns were either drum columns (if small) or hollow core (if large). Piers were typically built out of masonry and were either square or rectangular. Capitals on columns were usually of the foliate Corinthian style. These were made from wood, then stone. Vaulted roofs generally featured barrel-vaults and groin vaults made of stone or brick. Eventually, these evolved into the pointed ribbed arch used in Gothic architecture. These were a regular feature of Romanesque churches. Types included: square, circular and octagonal towers. Pre-Romanesque architecture was the house style of King Charlemagne, ruler of the Franks (768-814). Following his coronation by Pope Leo III as the first Holy Roman Emperor, Romanesque architecture spread throughout his empire, which included much of France, the Low Countries, Germany, Northern Italy and parts of Spain, as well as Britain and Scandinavia. Supported also by the Ottonian Emperors during the 10th century, the Romanesque style was also embraced by the powerful Cluniac order, as exemplified by its headquarters at the Abbey of Cluny, in France, and by its magnificent pilgrimage churches of St Martin at Tours, St Sernin at Toulouse, and the Cathedral of Santiago de Compostela, in Galicia, Spain. By the tenth century, the period of great invasions which had continually threatened the West for the past seven centuries had just come to a close, and religious building was about to reach perfection. From now on, the tenth century, though still troubled, became a great period for construction. Structures which had been burnt or demolished by the Normans were speedily rebuilt. An entirely new taste evolved, a point of departure towards a fresh, logical kind of art: using fine stone, decoration stemming from basic features, such as door-jambs, and colour obtained not from inset bricks but from projecting string-courses opposing black and white and so bringing black walls to life. Apart from the solution to the problem of vaulting, all the ingredients of the later Romanesque style were already apparent in these buildings. The second half of the century witnessed an artistic revival instigated by Emperor Otto and his sons. (See also: Ottonian Art c.900-1050) As we shall see, architecture played a vital part in this, distinguished by the continuance of Early Christian and Carolingian formulas. Some of the noteworthy innovations of this period, including the siting of a transept organically linked to the other limbs of the building, lead directly to the cruciform Romanesque plan, the basic core of its finest developments. By the mid-970s the routes across the Alps were finally cleared of brigands and the way was reopened for exchanges between Italy, France and the German lands. There is a definite connexion between the easing of this situation and the migrations of craftsmen from Como who, with an extraordinary aptitude for expansion, conveyed their obscurely elabourated building techniques through the valleys and over the Alpine passes to distant countries. In 962, Emperor Otto I, then at the height of his political power, followed the example of Charlemagne and received the imperial crown from the hands of the Pope in Rome. The purpose of this act was not only to set a seal on the agreement emphasizing that the Papacy was dependent on the Empire. The Emperor was claiming the foundation of a stable order based on the Christian faith, and he well knew that no one in the West would contest this privilege with him. To the German Emperor all dreams of a hegemony seemed permissible, and architecture was the foremost of the arts to bear witness to the imperial splendour. Just as Charlemagne had done before him, Otto turned to Constantinople, marrying his son to the daughter of Emperor John Tzimisces. Under his grandson, Otto III, the Empire was enriched by an ascendancy which benefited the whole of Europe. Between the Emperor, known to posterity by the strange and untranslatable title of 'mirabilia mundi,' and Gerbert of Aurillac, who became Pope Sylvester II in 999, there existed a bond of souls. This was the majesty of the Pax Romana without recourse to arms. Otto died prematurely in 1002, and his death marked a fault in the political development of Europe. Before the end of the century his Utopian coalition was to be brutally shattered against the rock of Canossa. The entire situation changed. In the eleventh century the Papacy was no longer weak and docile as it had been in the previous century. Hildebrand succeeded to the throne of St Peter, as Gregory VII, in 1073. Born a Tuscan peasant he had taken his vows in the Benedictine monastery of St Mary on the Aventine, became chaplain to Pope Gregory VI and then a monk at Cluny where he had contact with Abbot Odilo and Grand Prior Hugh. Subsequently he was made a cardinal, became adviser to Leo IX, and legate in France and Germany. By his fearless attitude he roused the anger of the German king, Henry IV, who coldly deposed him at Worms with the aid of a council loyal to his interests. Gregory's reply was to absolve Henry's German subjects from all obligations to their sovereign. Their stern reconciliation at Canossa - which symbolized the submission of secular power to the Papacy - was only temporary and the return to antagonism lasted until the hard won Concordat of Worms in 1122. The dramatic repercussions of this antagonism were confined to the two protagonists - Germany vacillating between the Pope and the Emperor, and papal Italy. The whole of Europe, however, suffered from this surge of trouble. Apart from equivocal supporters and secret opportunists the Holy See at least had the ever loyal support of the strength of Cluny brought to its zenith by a century and a half of progress. By the express desire of its founder, Duke William of Aquitaine, the small community on the banks of the Grosne was recognized as a direct possession of St Peter under whose patronage the Duke had purposely placed it. It continued to be granted exemption by the Popes with the result that its expansion was based on a jealously maintained independence of the local temporal and spiritual powers. The eminent Abbots of Cluny, Odo, Aimard, and Mayeul, set about transforming their humble monastery into a powerful influence and initiating a much needed reform of the Church and its morals. Bound by affection and a mutual deference to the rulers of Germany, Mayeul and his successor, St Odilo of Mercoeur, acclaimed their consecration as Emperors, and Hugh of Semur who followed Odilo in 1049 was Henry IV's sponsor. The subsequent struggle between the German king and Gregory VII put him in an embarrassing and uncomfortable position. At Canossa he wholeheartedly interceded for the penitent king, but he was, and continued to be, on the Pope's side. When, a few years later, Gregory, in order to repay the Abbot for his loyalty, publicly praised the abbey of Cluny he was only reaffirming what was well known already. Though formerly uninfluential, the protection of the reaffirmed papacy was a powerful aid to the consolidation of the vigour of Cluny which simultaneously made a return offering of its prestige and vast resources. The Popes strengthened the abbey with privileges and guarantees extending to the entire Congregation together with its priories overseas. Gregory VII never renounced his role of Cluniac monk even when he succeeded as supreme head of the Church, and Popes Urban II and Pascal II who followed him were also Cluniacs. Pope Gelasius II who had been forcibly expelled from Rome by Henry IV came to die at Cluny in 1119, and his successor, Calixtus I, was elected there. When, after the death of Honorius II, the Pierleoni faction set up the anti-pope Anacletus II in opposition to the newly elected Innocent II, the Cluny Abbot Peter the Venerable, unlike the vacillating Bernard of Clairvaux, immediately declared for Innocent, received him and give him encouragement. It is no exaggeration that, from 1049 until the end of the schism in 1138, the fortunes of the Roman church could be identified with those of Cluny. Romanesque architecture reached its zenith in the eleventh century hinging on the year 1095 when Urban II proclaimed the Crusade, and it would be pointless to ask what this medieval civilization would have been without Cluny. However, we should recall that, besides the great abbey church built by St Hugh, many of its outstanding masterpieces were also Cluniac properties or foundations. In Burgundy the list includes Vezelay rebuilt by Renaud of Semur, the grand-nephew of St Hugh, Paray-le-Monial, and St-Germain at Auxerre; in French-speaking Switzerland, Payerne and Romainmotier; in Nivernais, St Etienne at Nevers, La-Charite-sur-Loire, and Saint-Reverien; in Bourbonnais, Souvigny, and Chatel-Montagne; in Provence, Saint-Marcel-les-Sauzet, and Ganagobie; in Roussillon, Arles-sur-Tech; in Languedoc, Saint-Gilles-du-Gard, Morlaas, Moissac, Figeac, Marcilhac, Carennac, and Beaulieu; in Auvergne, Saint-Geraud at Aurillac, and Mozat; in Limousin, Saint-Martial, Chambon, La Souterraine, and Uzerche; in Saintonge, Saint-Eutrope; in Poitou, Montierneuf; in the Ile-de-France, Longpont, and Saint-Leu-d'Esserent; in England, Lewes; in Spain, Fromista. These names are chosen at random from among the astonishing list of Cluniac buildings surveyed by Dr Joan Evans. Above all they bear witness to the eclecticism of Cluny which never imposed itself as a prototype on any of its daughter foundations and, despite the organic centralization favoured by Abbots Odilo and Hugh, allowed individual regional tastes free development. This flexible independence did not survive the decline of the Cluniacs. With the early years of the twelfth century the Cistercians and, to a lesser extent, the Cartusians took up the position formerly held by Cluny in religious affairs. The original asceticism of the Carthusians, the austerity enjoined on the Cistercians by St Bernard, and the evolution of history itself, now determined the prototypes to which builders throughout Christendom had to refer. The creation of the military orders also reinforced this ascetic approach to religion. The conventual churches of the Templars and Hospitalers were not outstanding for their size or fine architecture, most of them being plain, small-scale buildings. This aspiration to poverty, a reaction against the excessive luxury of the Church, even extended to Peter the Venerable, despite his artistic heritage. Very significantly it also agrees with the opinions expressed by Peter Abelard in the directives which he wrote to Heloise. In fact, it was the aspiration of all the monastic reformers of the late eleventh century and, moreover, coincided with the movement in Islam which just as firmly repudiated the rich decorations and facings of the mosques of Spain and the Maghreb. Thus it is not out of place at this point to draw attention to the fact that one of the earliest examples of this change in architectural style is to be found in Aragon, a region which had contacts with both Christian and Moslem civilization. In the late eleventh century the royal Augustinian foundation of Siresa hidden in one of the valleys of the Pyrenees chose a completely austere approach which was strictly opposed to all ornamental or figurative experiments. Throughout the eleventh and twelfth centuries, rival religious houses continued to be constituted, and abbey charters other than those of Cluny bear witness to the foundation of country priories devoted to cultivation of the land. The great trade routes were reopened with a lively increase in traffic across the Alps now freed from local raiders; merchants from Flanders, the Rhineland, and the cities of Lombardy mingled with soldiers in the field, abbots on their missions, and pilgrims on their way to Rome. Suburbs with shops sprang up around abbeys sited near city gates, and an invigorating taste for adventure succeeded the heavy social inertia of the tenth century. Undoubtedly one of the most striking expressions of this mood was the development of pilgrimages. In fact, these had never completely ceased. Even during the most troubled years of the ninth and tenth centuries, bold spirits kindled with enthusiasm and braved every kind of danger to embrace the rock of Calvary and kiss the tombs of the apostles. With the eleventh century, however, began a troubled period which once more disproved the theory of a new dawn about to break. The mad Caliph, Hakim, sacked and destroyed the Latin foundations and, afterwards, the Byzantine Emperors took the place of those of the West in the task of restoring and safeguarding the Holy Places. Roman Christendom, however, was tortured by remorse and filled with desire to regain the tomb of Christ even more than the pilgrimage road which had never been completely cut even at the period of the worst setbacks. When the Cluniac Pope, Urban II, proclaimed the Crusade at Clermont-Ferrand, he roused an indescribable enthusiasm which showed that the time was ripe. The results of his expedition, the conquest of Palestine and the establishment of the Latin kingdom were manifold. In the field of architecture, the building of the Romanesque Church of the Holy Sepulchre was an outward sign both of the power and love of the Crusaders. The principle of the orientation of churches was so strongly ingrained in this generation sated with symbolism that, even in the hard-won city of Jerusalem, the new shrine had its chevet at the east end like any other church. To Constantine's rotunda which had last been reconstructed to the orders of Emperor Constantine Monomachos in 1045 was added a compact, cruciform design with a wide projecting transept and a semicircular choir surrounded by an ambulatory with three radiating chapels. On the south is a double entrance door between the belfry on the left and the square Calvary Chapel on the right. The building was consecrated in 1149 and offers a combination of styles inherited from East and West, including motifs from Poitou, Burgundy and Languedoc. There is even a rib vault over the transepts. This impressive building dominated a vast development program of churches, monasteries, commanderies, and hospices balancing the securing of the frontier defences by the huge fortresses of Beaufort, Margat, and Krak des Chevaliers. These cyclopean buildings with their formidable roughstone walls covered with mason's marks and their moats hollowed out of the rock are, in fact, the forerunners of modern concrete shelters and emanate the same feeling of stifling oppression. This large-scale undertaking introduced western building methods to the East while, simultaneously, the sight of the fabulous treasures of Constantinople kindled fresh flames in the ever lively imaginations of Christian builders. The same overflow of abundant energy, at a somewhat more realistic level, brought about the twofold conquest of England and Southern Italy by the Normans less than two hundred years after their establishment in 911. They introduced their great timber-roofed churches with hollow walls and lantern towers to Britain and, between 1066 and 1189, built no fewer than twelve hundred castles which gradually benefited from lessons learned by military architects in the preparations of the defences of the Holy Land; the ruins of many of these may be seen today throughout England and Wales. In their Mediterranean territories, at Monreale, Palermo, and Cefalu, they produced the most amazing blends of Arab, Byzantine, and Nordic influences to be found in the Romanesque world. The two other major pilgrimages to Rome and Santiago de Compostela were somewhat less dangerous than that to the Holy Land and, from the tenth to the twelfth century, were almost equally popular. The restoration work on the route undertaken by King Alfonso V in the early years of the eleventh century coincided with the progress of the spread of the Gospel among the Basques who soon freed the western passes of the Pyrenees. The stubborn forcing back of the Arabs crowned by the conquest of the Rioja enabled Alfonso VI of Castille to pursue the systematic organization of the fine road which soon received the title of 'camino.' This great work involved the building of several bridges and showed that, contrary to what has often been supposed, the Romanesque genius did not scorn material aids to achieve versatility. The power of Cluny came to the aid of the undertaking, made itself felt throughout the road's dangerous length, and effectively lent its support. The movement of countless pilgrims across the lands of Christendom, ships going to and fro across the sea beneath the equivocal sign of the Cross, treasures scattered, like the gifts of the Magi, round the slabs on which rest the witnesses of Christ, hymns and songs enfolding the marchers - all this ferment lies at the very heart of Romanesque civilization. The eminent archeologist Pierre Lavedan classified Romanesque architecture according to the vaulting system adopted in the main nave. He distinguishes three groups: (1) churches with tunnel or groined vaults without galleries over the aisles; (2) churches with tunnel or groined vaults with galleries over the aisles; and (3) churches vaulted with a series of domes. The first category includes Burgundy, Poitou and Provence; the second comprises the fine series of churches in the region of Clermont-Ferrand and the group known as churches of the pilgrimage roads; and the third besides the compact group of domed churches in Angoumois, Perigord and Quercy, three separate buildings which seem to have little connexion with one another or their surroundings: St Hilaire at Poitiers, Solignac, and the cathedral at Le Puy. This classification at least has the advantage of being original. Cleverly avoiding previous theories, it acknowledges the basic preoccupation of the Romanesque builders - the search for a vaulting system which maintained an even balance, and takes note of the varied solutions proposed. From time to time, churches of timber construction were destroyed by great fires and this encouraged their builders to use stone instead of inflammable materials. Stone vaults also lent an interior far greater dignity, unity and structural solidity than could be obtained from timber vaults or flat ceilings. To limit the field of Romanesque expansion to vaulted churches is, however, too severe a restriction and involves the entire elimination of Scandinavia. The timber-roofed naves of the eleventh and twelfth centuries do not indicate the survival of an outdated tradition in church building; they pursue and develop individual constructional experiments in the fields of rhythmic elevation and the division of masses which are no less revolutionary than the vaults devised by Romanesque architects. Some architects and archeologists have identified a separate school known as 'the churches of the pilgrimage roads'. This includes only three surviving buildings: the abbey church of Conques, the church of St Sernin at Toulouse, and the cathedral of Compostela. There were also, however, two churches now destroyed: the pilgrimage shrine of St Martin at Tours and the abbey church of St Martial at Limoges. The building of these five churches extended over the whole of the eleventh century and carried on into the next, maintaining remarkable fidelity to the original conception. This was on a generous scale to allow for the handling of large crowds; chevets were prominently developed and allowance was made for movement around the high altar; both transepts and naves were flanked by aisles, and above these were quadrant vaulted galleries with twin arches opening on to the nave. The spread of this formula resulted in some striking buildings elsewhere, including St Remy at Rheims, Saint-Sauveur at Figeac, and churches at Marcilhac and St Gaudens. Connexions may also be noted with the great Romanesque churches of Lower Auvergne, and the harmonious ternary rhythm of St Etienne at Nevers plainly seems to derive from it. There also arose a simultaneous belief that it was possible to solve another riddle of Romanesque architecture which had formed a stumbling block in the classification of provincial schools, by recourse to the theory of roads. Aquitaine possesses a magnificent group of churches spread out across Angoumois, Saintonge, Perigord, Quercy and the Limousin, which are vaulted with a series of domes. These roof choir, nave and transepts, as well as the crossing. This arrangement results in a startling monumental effect completely different to the narrow divisions formed by the more usual vaulted naves: it expands the interior space to the greatest possible extent and the resulting plan is defined by a succession of perfect squares penetrated by waves of light and providing total visibility as there are no interior pillars. There is a rhythmic sense of movement from bay to bay which seems to be inspired by the swelling domes. The outer areas are only fully developed in the chevets with their small radiating apses. In periods of insecurity such as the crusade against the Albigensians and the Hundred Years' War, these buildings were easily adaptable for defence purposes. These churches may have derived from Christian Byzantine art, but their grouping and distribution remain subjects of discussion. In drawing up a survey of these domed churches, it has lately been noted that they are scattered along the Roman road which led from Rodez to Cahors and thence to Saintes by way of Perigueux and Angouleme, and was still in use during the Romanesque period. Why, however, out of all the great roads crossing medieval France used alike by pilgrims and business traffic, should this have been the only one to produce a vigorously defined architectural formula? Why did the extension of this type towards the east die out on the first slopes of the Massif Central, when the distance between Rodez and Auvergne, the Velay and the Mediterranean regions is really no more than that covered by the western section of the old road? This theory of the road is no more than approximate and does not explain the most distant manifestations of the style, lost amid many other forms, at St Hilaire in Poitiers, the abbey church of Fontevrault in Touraine, and the cathedral of Le Puy. Originally the great Romanesque churches glowed with rich materials, gilding, colour and light. Their architecture reigned supreme; stone sculpture surrounding their doors were subservient to it. The interiors of some of the churches were entirely covered with mural paintings, the most famous example being Saint-Savin-sur-Gartempe where the section of the vault over the main nave was modified as work proceeded. Recent restoration at the pilgrimage church of Saint-Julien at Brioude has revealed traces of strong toned colours and bold marbling effects on the pillars. There seems to have been a special liking for such magnificently coloured buildings throughout Poitou, Touraine and Anjou, but the washed-out, velvety tones we now see are no more than approximations of the originals. In these regions, the extraordinary richness and liveliness of the wall paintings does not appear to be, as elsewhere, a convenient substitute for the lost art of mosaic, but a technique in its own right, accomplished, highly inventive and conforming to its own individual laws. The lack of local workshops with suitable qualifications often caused the replacement of large painted compositions by mere semblances of decoration. This uniformity was crowned, however, by the highlights of painted decoration applied to capitals and tympana, and extending to the triumphal representations of Christ in majesty surrounded by the symbols of the Evangelists in the apses. In odd corners of the church on free spaces of wall specially prepared at eye level, some imaginative artist would portray a patron saint or some edifying scene whose unexpected appearance disrupted the symmetry of the walls. This contributed to the flexible expansion of free, spontaneous life which enhanced the medieval churches and prevented them from becoming stereotyped and monotonous. An atmosphere of light and glowing colour seems to have been one of the basic spiritual needs of the Romanesque. Peter the Venerable, known for his detachment and his desire to restrict the Cluniac order to a life of asceticism, once alluded to the impression made on him by the paintings of a Cluniac chapel, "by far the most beautiful of all churches in Burgundy." This sense of delight included objets d'art, especially goldsmiths' work which was considered vital to architecture and enhanced its effect. Altars, canopies, chandeliers and lights were encrusted with gold, silver, enamel and precious stones. The miraculously preserved treasury of the abbey of Conques gives us some idea of the attraction of such riches. Conques was not the only abbey in a position to embellish its magnificent church with precious crafts and ornaments. Every monastery, cathedral and pilgrimage shrine felt obliged to collect and nurture a treasury which could be an outward sign of its fame. In matters of Romanesque archeology it is always essential to refer back to Cluny: here, an inventory of relics, jewellery, liturgical ornaments and illuminated manuscripts, taken in 1304, listed no fewer than 225 items, most of which probably date back to the Romanesque period. Is it true that Romanesque buildings were the work of labourers possessed of talent but collectively anonymous, and without any pretensions to individuality, whereas Gothic architecture witnessed the revival of the master architect who was creator of the design and supreme head of the workshop. Until quite recently, Romanesque was held to be an art of masons, but contemporary judgment is fairer. There is no doubt that Romanesque architects had little mathematical knowledge, but this was compensated by an acquired skill which, in its sheer boldness, sometimes recalls that of modern architects working with reinforced concrete. They were not trained engineers, but practical men sprung from the soil and attuned to its rhythms and its powerful empiricism. As has often been noted, to achieve the cross they used simple geometrical shapes: squares, rectangles, circles and semi-circles, renouncing the elegant but exaggerated forms of the Arab and Mozarabic styles. They made precise enlargements and adjustments with the help of symbolic combinations of figures that had been known since antiquity, though extreme caution should be exercised in checking, these on the ground today. It is fairly safe to say that Romanesque architects, like all really inspired creators, were capable of visualizing their finished buildings from the moment of their foundations being laid; they projected and outlined designs which clung to the soil and perfected the landscape. They did not hesitate to remodel and revise their plans as they worked, sometimes demolishing what they had already built if they thought the results would benefit the overall composition. They were servants rather than masters of their designs and maintained the right to make changes up to the completion of the work. Thus, in the early twelfth century, the choir of the Cluniac priory church of La Charite-sur-Loire was demolished, even though the preliminary work had only just been completed, and rebuilt on a grander scale, possibly because it had been considered too small for the importance of a church which attracted so many pilgrims. At Saint-Savin-sur-Gartempe there was a still more spectacular piece of unforeseen reconstruction. Here the architect had visualized a nave with a tunnel vault supported on transverse arches, and the first three western bays were erected on these lines. The work of the fresco painter, however, seemed so promising that the chief architect apparently gave way to him and abolished all the other arches planned so that the artist could use the resulting vast expanse of wall. Leaving aside for the moment the enormous Rhenish cathedrals and the principal pilgrimage churches which excite so much admiration today, there are many well-known buildings of secondary importance which have so much individuality that it is almost impossible to deny the hand of an undisputed master architect. To take a single example from the countless ones available: the choir of the church of Chateau-Meillant in Berry. This does its anonymous builder great credit with its striking array of seven apses and its airy combinations of twin pierced arches supported on slim columns so that they communicate with one another. To take a more famous example, the cloister at Moissac with its assured composition, its harmonious succession of slim single and double columns, and its sequence of identical splayed capitals, denotes first and foremost the proved skill of a talented yet modest architect who did not see fit to leave his name to posterity on the inscription commemorating the actual building. Tragically, we cannot attach any architect's name to the amazing abbey church of Charroux in Poitou. Before its wanton destruction, this must have been one of the most perfect and original of all Romanesque achievements. The Benedictine abbey of Charroux was founded in the second half of the eighth century and became famous on account of the council which was held there in 989 in an attempt to bring about the Peace of God. It also possessed a treasury of holy relics some of which had actually been handled by Christ. To house these and present them with due solemnity to worshipping pilgrims, an exceptionally ambitious building program was devised, involving an audacious blend of the two seemingly incompatible plans inherited by the Romanesque world: the cruciform basilica and the rotunda. So far, these two traditional designs had either been treated separately or simply juxtaposed. It was left to the unknown architect of Charroux in the first third of the eleventh century to realize their organic combination by inserting a vast rotunda in the heart of his building, at the crossing. Here there was a central space from which pilgrims could look down on the relics in the crypt; this was bounded by eight four-lobed pillars and extended by a triple ambulatory which decreased in height. Wide transepts with small apses on their eastern sides projected to north and south, and a semi-circular chevet, probably with small radiating apses, prolonged the rotunda to the east. Worshippers entering the nave must have been struck by the immense height of the crossing which was filled with light penetrating through the numerous bays. A double system of superimposed arches surrounded the central space with its raised altar, the lower ones acting as supports. At ground level the plan was circular, but higher up became octagonal to receive the segments of the lofty tunnel vaults over the first of the ambulatories. Unfortunately, all that survives of this impressive and unique building is the lantern-tower dominating the squat roofs of the now small, sleepy town. Identifying the functions of individuals, however, is no easy matter. First it is necessary to distinguish between the administrator of the works and the technician responsible for the direction of the workshop, and the teams of quarrymen, builders and decorators. The Chronicle of St Benigne which describes the rebuilding of the Benedictine abbey church at Dijon shortly after 1100 is most illuminating on this point. It shows that the direction of the undertaking was divided between two authorities. The Bishop of Langres, who initiated the restoration of the ancient monastery, was in charge of the financial administration, and organized the transport of materials to the site. To Abbot William fell the twofold task of "specifying the work itself" and "directing the labourers." Second, just because a name is carved onto a stone, it doesn't necessarily mean that the person concerned had a significant role in the building work. Many Romanesque capitals in Spain, Italy and France bear signatures, but many of these unexplained names raise inexplicable problems. On the doorway of the cathedral at Ferrara, for instance, may be found the signature of Master Nicolo, one of the first identified sculptors of Romanesque Italy. His work shows Byzantine influence, but his individual talent endows his carvings with dramatic realism. He may have been responsible for the fine reliefs on the fagade of San Zeno at Verona, but his identification with the Nicolo who, in 1135, signed a capital in the Sacra di San Michele in Piedmont is by no means certain. Throughout the eleventh century the liturgical life of the great abbey of Cluny unfolded against the background of the church begun by Abbot Aymard, probably after 948, and consecrated during the period of office of Abbot Mayeul in 981. This building, dating from the very end of the pre-Romanesque period, was certainly important even though by no means a masterpiece. Basilican in plan, its nave of seven bays was unvaulted, flanked by aisles, and cut by a narrow transept which projected widely from the body of the church, each arm ending in a small semicircular apse. The deep-set choir had pillars and a semi-circular apse flanked by two small apses which protruded from the straight walls. Between the choir aisles which gave access to these chapels and the small apses at the ends of the transepts were inserted two long rectangular rooms divided by interior partitions and linked by narrow passages either with the transepts or the sanctuary. The composition freely developed the monumental plan of graded apses, known as Benedictine on account of its frequent, though not exclusive, use by this order. Romanesque architects derived some fine effects from it. The nave at Cluny was preceded by a narthex or galilee which heralded the beautiful closed porches flanked by towers which were the work of the following generation. Building was resumed by Abbot Odilo who did not limit his activity to Cluny but devoted himself to many churches elsewhere, including Payerne, Charlieu, Ambierle-en-Forez, Ris and Sauxillanges in Auvergne, Souvigny, Saint-Saturnin-du-Port in Provence, and Lavoute-sur-Allier which he founded on one of his own estates and later became the starting point of one of the routes to Santiago. At Cluny he devoted his final years to the building of a beautiful cloister, but first restored all the interiors, except for the walls of the church: it is thought that he had a stone vault constructed, replacing the timber roof. This church, a little less than 150 feet long, was sufficient for the needs of a medium sized community. The continual growth in number of the brethren in the course of the eleventh century rendered it too small, however, and Abbot Hugh of Semur was forced to envisage not merely rebuilding and extension, but the construction on the grounds to the north, of an abbey church surpassing all those of Western Christendom in size. A heavy annual tribute drawn from the kings of Spain assured the financing of the undertaking conceived as the outward manifestation of the power of the head of the order. The design of the new church with its nave of eleven bays flanked by double aisles to balance its length, its two transepts and ambulatory with small radiating apses was so magnificent as to earn it the name of 'the angel's walk.' Decorated with sculptures, mosaics and murals, and envied by all Christianity, St Hugh's abbey church was to remain the pride of the Cluniac order for seven hundred years. A short time before, in the eleventh century, the cathedral of Compostela was enlarged as the result of a threefold collaboration. Bishop Diego Pelaez who occupied the see from 1070 to 1088 decided to rebuild the basilica commissioned by Alfonso the Great in the late ninth century, devasted by the raider Almanzor and restored by Alfonso V. The general direction of the work was entrusted to qualified representatives of the cathedral chapter, one of whom, Bernard, known as the Old, was responsible for the plan. According to the 'Pilgrims' Guide' which has left us a valuable description of the great cathedral, he was assisted by a deputy named Robert and about fifty stone-cutters. The guide describes him as a stonemason; it also calls him 'domnus,' which leads to the belief that he may have been a clerk, many of whom, in the opinion of archeologists, were of French origin. Certainly the name Bernard is not a familiar one in the Spanish language. Others identify him with the Bernard who was treasurer of the chapter and was responsible for the monumental fountain which greeted pilgrims from France on the square to the north of the basilica. However this may be, he was possessed of a lively, eclectic talent and worked on the churches of St Martial at Limoges, Sainte-Foy at Conques and St Sernin at Toulouse. Master Stephen also worked on the site at Santiago with such excellent results that, in 1101, he was requested to provide plans for the cathedral at Pampeluna. Similar organization was favoured for the building of the fine Cluniac priory at Montierneuf at Poiters. Under the command of Prior Guy, who was the nephew of St Hugh and may well have modelled himself on his uncle as patron and builder, the work was directed by a monk named Ponce, assisted by Mainard, a master-mason or stone-cutter. This building was not begun until 1077, but the church was either finished or very near completion on its consecration less than twenty years later in 1096. Romanesque buildings may be on a grand or intimate scale, of expert or crude construction, fashioned either of well joined blocks or of common pebbles sunk in mortar, They range from lordly abbeys or Norman castles silhouetted against the sky, to simple rustic sanctuaries conceived as separate entities. In all these cases, Romanesque architecture avoided the monotonous standardization of imperial Roman architecture, from which it claimed descent and which had spread across the world. The precarious background to existence, including war, famine and epidemics, and the ascendency of the feudal lords were enough to explain the almost complete absence of any preoccupation with large-scale town-planning comparable to the majestic schemes handed down by the ancient civilizations of East and West. In these disturbed times every inhabited area had first to be a defence and refuge. In the Romanesque world there were no longer any triumphal ways bordered by tombs, sumptuous buildings, or arches to delight vain conquerors. It was not until the decline of Romanesque civilization that new cities were created, and rediscovered the lost secrets of squares and the logical organization of space. Within Romanesque towns, picturesquely named streets, alleys and gutters, rather than noble avenues, formed a complicated maze. Instead of temples or mausoleums, they were bordered by a confusion of buildings bearing no relation to any mathematical law. At Cluny in the twelfth century, the rue d'Avril, probably the oldest street in the town, winds, like an earthworm, between low, unaligned houses in the Romanesque tradition, with twin arcades of pointed arches at ground level surmounted by arcaded galleries. Romanesque masons were far from being theoreticians. Their sparing economy, absolute rejection of waste, practicality, and liking of security in preference to any form of expensive elaboration, were all good "peasant" virtues. To oversimplify a complex situation, every facet of Romanesque architecture brings us back to a few very simple rules: organisation of space into regular bays, and the juxtaposition or occasional superimposition of conventional masses arranged as interlocking cubes. Every advance in technical progress, whether the result of a migration of craftsmen, a detail seized by the quick eye of an architect, or a political conquest, was adapted to fit in with this schematic outline. Thus, military architecture profited from the Crusades by the discovery of the complex layouts and round sections of Byzantine fortifications. The old keeps of the eleventh century perched on their artificial mounds practically disappeared or were shut up behind a network of wards and casemates. Their construction involved the fitting together of a series of quadrangular spaces, which set far fewer problems than the building of the round towers of the retaining walls which must have contributed to the spread of domical vaults. Church building which was more detailed but less inventive, proceeded on the same basis. In particular, what needs to be appreciated is the spatial rhythm brought about by the succession of bays, like a ball which a group of players passes from one to another; for this is one of the richest, most evocative effects of Romanesque architecture. This interior movement, brought about by the balance of basic elements such as pillars and transverse arches, arcades and clerestory windows, is echoed by the exterior elevations punctuated by buttresses and lightened by bays and intermediary arcading. These two categories are only seemingly contradictory. Recession and hollowing out make walls thinner and lighter as they get higher. Corbelling, on the other hand, causes the entire weight of a building to rest on a support diminished by the interplay of successive steps which submerge and divide internal pressures like the motion of invisible waves. The efforts of Romanesque architects were concentrated on assuring the structural independence of the vaulted bay. The basic element was either led to independent organization by the interaction of carefully elaborated balances, or was assisted by external supports. So many different procedures and interior arrangements resulted from this choice that it would almost be possible to use them as a basis for a new system of classification for Romanesque architecture. The single naves, so suited to the demands of the liturgy (they were not divided by screens), had to make up for the absence of buttresses by a system of cloister or domical vaults which contained their own thrusts. Tunnel-vaults, on the other hand, required buttresses which could only be effective if they were applied to the probable breaking point or to the actual base of the vault. These conditions created quadrant-vaulted aisles, especially those which supported galleries so favored by the architects of Auvergne. Built after 1000 with the aid of rudimentary techniques, the narthex at Tournus turned out to be one of the most masterly constructions and one of the most powerful spatial combinations of all Romanesque architecture. At Cluny, less than a hundred years later, imperfect buttressing of the nave by the groined-vaulted aisles was avoided by doubling and staging them, thus containing the opposing counter-thrusts engendered by the pointed tunnel-vault of the nave itself. To complete his task and bring a collection of dead colours to life, a fresco painter takes up his brush and, with a few dazzling strokes, heightens the light on a face, emphasizes the fall of a drapery, or accentuates a contour. His work glows and is transfigured as if suddenly projected from the shadows. Just as with sketches, the technical construction of balanced masses lacks this final touch of genius. In Romanesque architecture sculpture assumes the important function of the final touch without which the most beautiful framework is no more than a dead skeleton. Like the painted decoration on the surface of an antique vase, it endows an apparently logical, functional structure with a touch of the irrational. It is surprising to find what a small part of the total surface of a Romanesque building was given over to sculptural decoration, whether reliefs or statues. The objective subordination of ornament is made clear by the fact that the architect almost always reserved it for the key points of the structure. On exteriors, sculpture was limited to three well spaced features: cornices, arch moldings, and the tympana surmounting doorways. A cornice runs along the top of a wall below the fall of the roof which it stresses with its firm line. The corbels which support the ledge at intervals add a flickering effect. In eastern France they are usually plain, but, from Spain as far as Berry, they are decorated with tongues and scrolls, suggesting Arab influence. In western France these are found next to figured corbels, a system which gradually extended to the banks of the Loire. These small areas did not offer much scope to sculptors depicting men or animals. In some churches in Saintonge and Upper Auvergne, however, the ingenuity of artists, for whom no detail was of minor importance provided it played its part in the whole composition, endowed these small features with the entire range of their spirited imagination. Arch moldings have a twofold function. They frame windows and doors with their curves and so serve to stress their structural roles. They also help to lighten the walls in which these apertures appear by a series of recessions and projections. By this means it was possible to avoid an ugly effect of coarsely scored stone. Usually, Romanesque sculptors reserved their skill for the archivolts of doorways whose large proportions were ill suited to being left bare, and limited the decoration of the smaller bays to discreetly molded keystones. In the West, however, and especially in Saintonge, they heaped decoration on them all, covering their surfaces with scrolls and palmettes or with small figures corresponding with the radiating axes. These great sculptured portals proceeded from the unquestionable renaissance of the sculptor's art which, shortly before the twelfth century, completed the great architectural experiences of the eleventh and at the same time marked the result of all the continuous investigations since 1000. Their simultaneous appearance in Languedoc and Burgundy is proof of the scope of the development. The light, sober compositions of the Porte de Miegeville at St Sernin, Toulouse, and the west portal of the great church at Cluny give way to the frenzied apocalyptic visions and Last Judgments of the twelfth century. Gradually, sculpture achieved a fresher, richer and more mobile outline. Attempts have been made to establish a connection between these great sculptured portals and the movement of pilgrims to Santiago. It is true that two of the most famous examples at Vezelay and St Gilles-du-Gard belong to shrines listed in the 'Pilgrims' Guide' as important stations on the road. Nevertheless, their almost total absence in Velay and Auvergne, despite the fact that these regions were traversed by many of these routes and were sanctified by the presence of many holy relics, very much weakens this theory. Moreover, Poitou and Saintonge, though crossed by the western roads, offer no examples of this type. We may do better to take note of the geographical setting of these sculptures which must have been difficult to assemble. This invariably coincides with outcrops of limestone, a resistant material, easy to carve and cut up into large slabs, something which can hardly be said of the granite used for the churches of the Massif Central. Two types of capital exist side by side. Each one crowning an isolated column is a complete entity. They are shaped either as truncated cones, or as cubes with their lower parts rounded off. When the column is reduced to a half-cylinder and forms a respond the capital is merely cut in half vertically and its profile remains unaltered. These surfaces were suitable for leaf carving but were not as satisfactory as fiat expanses for the representation of human forms. Plant sculpture on stone seems never to have died out, but the representation of human forms had not been attempted until the Romanesque sculptors boldly launched the attack. Their earliest efforts, dating from about 1000, are hesitant and unformed but also surprising on account of their implied promise. The rules which these anonymous pioneers strove to formulate were those which were to continually engage the attention of later sculptors. Once again the creative process is clearly revealed at St Benigne in Dijon. Almost all the capitals of the rotunda were undecorated except for those framing the west entrance which were adorned with strange, turbulent compositions in relief, one of which has been identified by Andre Parrot as the symbols of the four evangelists. It is difficult to realize that these compositions, examples of an already accomplished technique, are contemporary with the childish gropings expressed in some of the ambulatory capitals. With due regard to the shape of the capital, an imaginative craftsman (ill-served by imperfect execution) has attempted to portray a figure in prayer. The roughly worked head has a low forehead vaguely imitated from Roman art with a long beard divided into two points by a centre parting fitted between two clumsily raised arms. An unconvincing twist of the body causes the open palms to spread out to the corners of the capital which, elsewhere, are decorated with an abundance of elongated foliage. At the side the sculptor, either as a joke or as the result of an interruption, has left the sketched outline of his work inscribed on the surface of the stone - the furrow of the beard and the gesture of the raised arms. These glimpses of the capitals at Dijon are extremely valuable as they aptly sum up the basic principle of Romanesque sculpture: its absolute subjection to the shape and plan of supports, no matter how exacting these might be. This explains the anatomical deformations, excessive elongations and foreshortenings sometimes in combination, which so puzzled nineteenth century art historians. Romanesque sculptors hardly ever thought of imitating nature except in secondary details. Starting with an instinctive idea, they experimented with lines on stone, forcing a shape upon them, just as one looks for a profile or silhouette in a dissolving cloud. They were especially influenced by the images found in Irish illuminated manuscripts, in which human bodies were twisted and bent into extraordinary attitudes. By means of bold foreshortenings, arabesques, distortions and baffling swarms of human shapes, the sculptors freed Romanesque architecture from its implacable logic, endowing it as if by magic with a sense of balance. The nearer this art approached technical maturity, the more it seemed to achieve a virtuosity essential to its needs. The scrolls and spirals of accomplished late works such as the wall at Charlieu with its agitated sculptures already showing signs of decline share the overwhelming spontaneity of the greatest frescoes. From this whirlpool of shapes arose a single idea and a sense of direction which overran the world. This evolution finally resolved the dramatic tension between souls attracted to order and tranquillity and yet set in a cruel, inexplicable world. Romanesque architects peopled the earth with churches and chapels symbolizing eternity. Yet their sense of anguish and consciousness of sin invested these buildings with strange, unhappy monsters representing a melancholy, heartfelt appeal to redemption. This bestiary of monsters, which took such a hold on Romanesque imagination, represented far more than a reservoir of forms and decorative themes. It was a type of classification of a haunted, frightening world and its resources, of evil. Everything there was linked in an infernal dance: nightmare animals, gryphons, monsters from the East, sciapods, dog-headed beasts and dwarfs with huge ears. They formed a strange picture of intellectual abandonment and sheer terror. To England the Normans carried from France the knowledge of mature Romanesque design and craftsmanship. The early English cathedrals were constructed in this style, and there were numerous Norman castles. It is said that no fewer than seven thousand churches were built in England in the century following the Norman Conquest of 1066. There had been a native Anglo-Saxon architecture, which was of heavy, sturdy type, and this contributed some minor features to the new expression. English Romanesque is usually known as Norman architecture. Durham Cathedral is the largest monument in which the original Romanesque character has persisted through later accidents and "improvements." But some of the most impressive bits of Romanesque construction are to be seen in the crypt of Canterbury Cathedral, in the transepts of Winchester, in the crypt of Worcester, and in parts of Peterborough. In general the English cathedrals had longer transepts than those in the typical buildings in France and a main tower was added over the crossing. Note: Unless stated, all dates refer to completion. For a fascinating comparison between East and West, see the extraordinary 12th century Angkor Wat Khmer Temple (1115-45) and the 11th century Kandariya Mahadeva Temple (1017-29). Following the early nineteenth century Greek and Gothic Revival movements in American architecture (and also in Europe), a number of American architects started a Romanesque Revival trend. The earliest of these was James Renwick (1818-95), whose design for the Smithsonian Institute ("the castle") in Washington DC (1847-55) made it the first American public building in that style. Another architect influenced by the Romanesque was Richard Upjohn (1802-78). The greatest exponent, however, of 19th century Romanesque revivalist architecture was Henry Hobson Richardson (1838-86) who was responsible for masterpieces like Trinity Church, Boston (1872-77) and Marshall Field Wholesale Store (1885-87) Chicago. We gratefully acknowledge the use of material from "Romanesque - Architecture of the World", published by Benedikt Taschen (1990).  For more about architecture in Europe, see: Homepage.